Posted April 8, 2019 by Dyllan Furness & filed under Newswire, The Tech. A new solution from Fortum, a Finnish clean-energy company, increases the amount of material in Li-ion batteries that can be recycled to more than 80%, according to the company. The current EU-mandated recycling rate is only 50% of the total weight of the battery. First the company makes the used batteries safe for mechanical treatment, directing plastics, aluminium and copper to their own recycling processes. Then it uses an industrial-scale, low-CO2 hydrometallurgical process to recover cobalt, manganese and nickel from the battery. 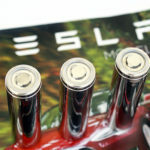 The chemical and mineral components of a battery form a ‘black mass’ that typically consists of a mixture of lithium, manganese, cobalt and nickel in different ratios. Of these, nickel and cobalt are the most valuable and most difficult to recover. Fortum uses a recovery process that involves a chemical precipitation methodology that allows these minerals to be recovered and delivered to battery manufacturers for reuse in the production of new batteries. The technology was developed by Crisolteq, which has a hydrometallurgical recycling facility in Harjavalta, Finland, where the black mass can be treated on an industrial scale.